If, like us, you’re the sort of movie fan who pours over box office numbers the way fantasy football owners pour over downfield completion percentages, then you’ve probably noticed some intriguing commonalities among several of 2018’s top performing films. Like Black Panther, which to date has tallied a whopping $1.3 billion worldwide (that’s billion, with a “B”) worldwide, or Crazy Rich Asians, currently at $236 million worldwide against a thrifty $30 million budget. With these hits has come a shift in Hollywood’s conventional wisdom: that films with diverse casts and creators are succeeding not despite inclusive representation and themes but because of them. 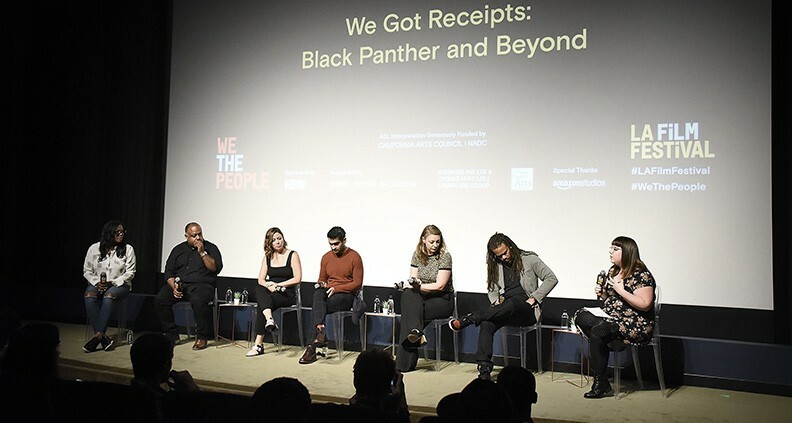 Such was the subject of the September 23 We The People Inclusion Summit panel “We Got Receipts: Black Panther and Beyond,” appearing at the 2018 LA Film Festival. Moderated by Kate Hagen, writer and Director of Community at The Black List, the panel featured Black List Founder Franklin Leonard, The Big Sick co-writers (and Film Independent Spirit Award winners) Emily V. Gordon and Kumail Nanjiani, filmmaker Kay Cannon (Blockers), writer Marc Bernardin (Castle Rock) and casting director Leah Daniels-Butler (Empire). Bet on inclusion. “It was conventional wisdom that you couldn’t sell diverse films, but [there weren’t] any facts to support it, it was just assumed to be true,” said Leonard. The lesson of Crazy Rich Asians, he said, was that the film “wasn’t a risk in the first place.” Later he said: “On a movie that’s not about white men, always take the over on the [box office] projections—I’ve never been wrong,” stating that so-called such films are continually underestimated. Casting a wider net. To her surprise, Cannon said she actually received a directive from studio brass to make sure Blockers was appropriately diverse—which she was thrilled about. Said Daniels-Butler: “The studios I’ve worked for, they all have some sort of diversity something,” she said, though regarding studio inclusion initiatives—particularly for writers—Bernardin observed: “Baby writers are paid for by the studio. The next yeah, uh oh, now they cost [the show] something,” and that such writers often have trouble advancing to the next level. Learn how to become a Member of Film Independent by visiting our website. The 2018 LA Film Festival took place September 20-28. See more of Festival coverage on Film Independent’s and YouTube channel.